Multiple Intimidation Clothing alumni have been making waves around the sport of mixed martial arts, from the UFC to top regional promotions and beyond. A cast member of “The Ultimate Fighter 19,” Dan “Dragon” Spohn (@dragonspohn) has gone on a hot streak since his lone UFC appearance following the show, winning three straight bouts in regional action. Now, the longtime light heavyweight and former NAAFS 205b champion is about to get heavy, as the Ohio native is set to bulk up to the heavyweight division, where he will challenge Zu Anyanwu for the CFFC heavyweight title at CFFC 53 on Dec. 4 in Philadelphia. Fans interested in watching the bout can order the fight on GFL.tv. 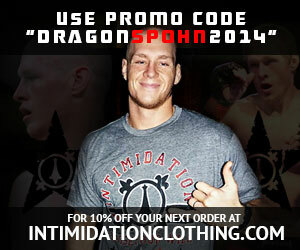 Spohn’s signature Dragon t-shirt is one of the most unique designs in Intimidation Clothing history, and fans can pick up the shirt right today, Cyber Monday, for just $10. Another longtime sponsored fighter, Brian “The Predator” Rogers (@BRogthePredator) is set to make his 11th appearance inside the Bellator cage at Bellator MMA 147 on Dec. 4. The Ohio native – who now lives and trains in Denver, Colorado – is set to bulk up to the light heavweight division, where he will take on Strikeforce veteran Virgil Zwicker in a 205-pound bout. The fight will air on the main card live on Spike TV. Rogers is known for some of the most vicious knockouts in Bellator history, as his flying knee has become a signature and made him a fan favorite. Fans can pick up his iconic “flying knee” signature tee in the Intimidation store on Cyber Monday for just $10. Despite a 9-1 record, popular fighter Mark “The Pride of Bloomfield” Cherico (@MarkChericoMMA) has announced his retirement from the sport of MMA. The Pinnacle FC and Gladiators of the Cage featherweight champ has instead decided to focus on running his new gym, as Mark Cherico’s Martial Arts & Fitness will open soon in the Pittsburgh area. Fans still hope to see “The Pride” in the cage sometime in the future. Two fighters who were long sponsored by Intimidation Clothing recently put on a memorable performance in their matchup at Pinnacle FC 12 over Thanksgiving week. Khama “The Death Star” Worthy (@thedeathstar_1) and Antonio “Mexican Muscle” Castillo Jr. (@CastilloJR_MMA) showed why they have been fan favorites with a fight of the year performance in their co-main event. After Castillo dominated for much of the fight, the two spent time throwing flurries in rounds 2 and 3. Castillo dropped Worthy twice in the second round, but Worthy came out charging hard in the third round, landing a right hand and then finishing shots on the ground to earn the knockout. Check out this memorable fight here. Part of Intimidation’s massive growth in the Minnesota area, Jordan “Pretty Boy” Parsons (@PrettyBoyMMA_JP) has made a name for himself under the Bellator MMA banner. After a KO win in his first outing, Parsons submitted then 30-0 fighter Julio Cesar Neves. He recently lost his first fight for Bellator, but he figures to be a name to watch in the featherweight division in 2016. Another fighter who has been sponsored by Intimidation and has long been a friend of the brand, Daniel Straus (@DanielStraus), is once again the Bellator MMA featherweight champion. The Cincinnati native defeated Patricio “Pitbull” Freire on his third attempt to claim the 145-pound title for a second time at Bellator 145 on Nov. 6. Intimidation Clothing is a fast-growing brand of MMA lifestyle clothing with a growing national presence and over 50 authorized dealers across the USA. Known as the biggest supporter of local MMA, the Intimidation brand is also regularly featured on multiple sporting events on SpikeTV, AXS TV, SportsTime Ohio, MTV2, FUEL TV, The Comcast Network, Comcast SportsNet and EpixHD as well as MMA highlight shows on Spike TV, AXS TV and more. In addition to over 110 styles of high-quality, bold t-shirts and sweatshirts for men, women and children and is also known for their premium-quality EliteFighter MMA board shorts. Anyone interested in becoming a dealer can apply to sell the Intimidation brand as a dealer and they can be found for sale online at IntimidationClothing.com. Fans can also follow the marketing wing of the Intimidation brand, Intimidation Interactive Media, @IntimidationIM, like Intimidation Clothing on Facebook or follow @IntimidationMMA on Twitter. Shop the Intimidation Clothing Clearance section today! The weather is hot and the deals are sizzling online at IntimidationClothing.com. While four Intimidation alumni face big challenges at UFC on FOX 16, the company that has been well-known for supporting many of the top prospects in the fight game has added a variety of MMA fighter shirts to the sale rack. While the deals are temporary, the quality is alway great with Intimidation Clothing; from the 3.2 oz cotton/polyester blend of the Mark Cherico and Isaiah Chapman tees to the 100% cotton Brian “The Predator” Rogers flying knee KO tee. Loyal to the Women’s MMA and the Ultimate Fighting Championship? Both the Jessica “Evil” Eye and the Jessamyn “The Gun” Duke signature tees are available in unique men’s and women’s designs. While the deals are awesome for fighter shirts from the highest levels in the sport to the up-and-comers, these prices will not last long. Shop today online in the Intimidation Clothing Clearance section to take advantage today. Intimidation Clothing is a fast-growing MMA-inspired lifestyle clothing brand with a growing national presence and over 50 authorized dealers across the USA. Known as the biggest supporter of local MMA, the Intimidation brand has regularly been featured on multiple sporting events on SpikeTV, AXS TV, SportsTime Ohio, MTV2, FUEL TV, The Comcast Network, Comcast SportsNet and EpixHD as well as MMA highlight shows on Spike TV, AXS TV and more. In addition to over 110 styles of high-quality, bold t-shirts and sweatshirts for men, women and children and is also known for their premium-quality EliteFighter MMA board shorts. Anyone interested in becoming a dealer can apply to sell the Intimidation brand as a dealer and they can be found for sale online at IntimidationClothing.com. Fans can also follow the marketing wing of the Intimidation brand, Intimidation Interactive Media, @IntimidationIM, like Intimidation Clothing on Facebook or follow @IntimidationMMA on Twitter. Intimidation Clothing has long been a sponsor for up-and-coming and established mixed martial arts fighters, and recently MMA sponsorship experts from MMA Somnia reached out to the company to find out our philosophy in sponsoring fighters. What followed was an extensive quote from Intimidation CEO Luke Jernigan, who has spearheaded the brand’s sponsorship of hundreds of fighters throughout the years. Most notably, Jernigan discussed the brand’s desire to create long-term relationships and to create partnerships. Look to our friend William Hill – who offers the best odds for MMA betting. Jernigan also gave examples of two of Intimidation’s best brand ambassadors, Kyle “Kyote” Rozewski and Brian “The Predator” Rogers. Aside from being marketable in their own ways, both fighters have shown loyalty to the Intimidation brand throughout the years and both have helped take the brand to new heights. To read more of Jernigan’s quotes and quotes from other companies that sponsor MMA fighters, check out the entire article HERE. A pair of longtime Team Intimidation fighters were recently featured in an interesting feature on Bleacher Report, focusing on “The 7 Greatest Recent KOs You Haven’t Seen.” Those two fighters are Brian “The Predator” Rogers and Jordan “Pretty Boy” Parsons. Rogers was featured on this list at #4 for his vicious flying knee knockout over Adrian Miles at Bellator 119 in May. He’s made a career out of spectacular flying knee knockouts, as his knockout over Vitor Vianna at Bellator 61 has been named as the top KO in Bellator history multiple times. “The Predator” will be back in action looking for another KO when he faces James Irvin in the co-main event at Bellator 125 next month. These fighters are just two of the knockout artists on Team Intimidation. Others with notable knockouts include Dan “Dragon” Spohn, John Hawk, and more. Longtime Team Intimidation fighter Brian “The Predator” Rogers (11-6) will be back in the Bellator MMA cage next month, as he is set to take on UFC veteran James Irvin (17-10) in the co-main event at Bellator 125. In his last outing, Team Intimidation cornerstone fighter Rogers produced yet another highlight reel knockout win, as he put Adrian Miles to sleep with a flying knee in the second round of their middleweight bout at Bellator 119. Rogers has produced 9 knockouts in 11 career wins, and he produced the latest victory while walking out wearing his latest signature shirt, which features him landing one of his patented flying knees. The win was also the Attack Poker “Attack of the Night” on the Spike TV broadcast earning Rogers even more recognition with the fans of Bellator MMA who already know Brian from the flying knee KO of Vitor Vianna at Bellator 61. Irvin is no stranger to knockouts himself, as he has produced 12 of his 17 victories via strikes. The exciting nature of both fighters landed them a prime location on the Bellator 125 card, which takes place in Fresno, Califonia and airs live on Spike TV on September 19. A native of Northeast Ohio, Rogers trained with the Strong Style Fight Team for years but has since moved his fight camp to Colorado where he now trains at Factory X Muay Thai with the likes of UFC middleweight Chris Camozzi, Bellator champion and star Joe Warren, Team Intimidation’s Brian Camozzi, and more. A 2-time Bellator MMA Middleweight Tournament semifinalist, Rogers is no stranger to exciting finishes, including the aforementioned flying knee over Vitor Vianna at Bellator 61 that has been named as the best knockout in organization history multiple times. Known for his devastating knockout power, Rogers has compiled a long list of highlight reel knockouts and is one of the most popular middleweights in Bellator. Intimidation Clothing is a fast-growing brand of MMA clothing & training gear with a growing national presence and over 50 authorized dealers across the USA. Known as the biggest supporter of local MMA, the Intimidation brand is also regularly featured on multiple sporting events on SpikeTV, AXS TV, SportsTime Ohio, MTV2, FUEL TV, The Comcast Network, Comcast SportsNet and EpixHD as well as MMA highlight shows on Spike TV, AXS TV and more. In addition to over 110 styles of high-quality, bold t-shirts and sweatshirts for men, women and children and is also known for their premium-quality EliteFighter MMA board shorts. Anyone interested in becoming a dealer can apply to sell the Intimidation brand as a dealer and they can be found for sale online at IntimidationClothing.com. Fans can also follow the marketing wing of the Intimidation brand, Intimidation Interactive Media, @IntimidationIM, like Intimidation Clothing on Facebook or follow @IntimidationMMA on Twitter. As always, the Intimidation Clothing brand was a major presence at the annual Fight Nite in the Flats event in Cleveland, once again having a banner night at the 10th edition of the event. This year both Driven MMA and NAAFS teamed up to offer fans at Jacobs Pavilion a great night of fights, just as Intimidation and UR Fight teamed up to offer fans a one-stop shop for their MMA apparel needs. Intimidation Clothing sponsored four professional fighters on the night, including the winners in the night’s main event and co-main event bouts. In the co-main event, Isaiah “The Beast” Chapman (6-1) put on yet another impressive performance, as his signature shirts sold like hotcakes at the official Intimidation booth all night. Chapman (pictured, left) picked up his second victory in a row, earning a unanimous decision over fellow top prospect Andrew Whitney (9-3) in a featured bout. In the night’s main event, Team Intimidation fighter Frank “The Tank” Caraballo (13-7) earned perhaps the most impressive victory of his career, as he finished 2-time UFC veteran Tommy Hayden (6-3) via verbal submission in the second round. Other Intimidation pros in action included Evolve MMA fighters Kyle “Kyote” Rozewski (4-4) and Jerrell Hodge (0-1). In amateur action, a pair of Intimidation athletes from sponsored gyms squared off, as Rising Dragon’s Tobiaus Taylor (5-1) earned a split decision over GriffonRawl’s Ahmad Douglas (3-1). Longtime Team Intimidation fighter Brian “The Predator” Rogers was also in attendance, as he provided color commentary for the live Internet Pay-Per-View broadcast of the event alongside longtime announcer John Strmac. And current TUF 19 star Dan “Dragon” Spohn signed autographs for fans at the official Intimidation booth during intermission at the event with UFC stars Stipe Miocic and Jessica Eye signing beside him. Full results from Fight Nite in the Flats 10 can be found at BluegrassMMA.com. Looking ahead, Intimidation will be on hand selling at three events in three states next weekend, and two other Local MMA events will be sponsored by the brand. Intimidation will be on hand at IT Fight Series 26 in Columbus, OH, TNT Fight Series in Buffalo, NY, and Art of War 10 in Indianapolis, IN. Intimidation will also serve as a sponsor for Hardrock MMA 65 in Louisville, KY, as well as Caged Madness 29 in Ohio. Intimidation Clothing is a fast-growing brand of MMA apparel & fight gear with a growing national presence and over 50 authorized dealers across the USA. Known as the biggest supporter of local MMA, the Intimidation brand is also regularly featured on multiple sporting events on SpikeTV, AXS TV, SportsTime Ohio, MTV2, FUEL TV, The Comcast Network, Comcast SportsNet and EpixHD as well as MMA highlight shows on Spike TV, AXS TV and more. In addition to over 110 styles of high-quality, bold t-shirts and sweatshirts for men, women and children and is also known for their premium-quality EliteFighter MMA board shorts. Anyone interested in becoming a dealer can apply to sell the Intimidation brand as a dealer and they can be found for sale online at IntimidationClothing.com. Fans can also follow the marketing wing of the Intimidation brand, Intimidation Interactive Media, @IntimidationIM, like Intimidation Clothing on Facebook or follow @IntimidationMMA on Twitter. Throughout its history, Team Intimidation has come to be known for providing a wealth of highlight reel knockouts, from the Local MMA scene to televised bouts on AXS TV and on Spike TV & MTV2 with Bellator MMA. From being a longtime sponsor for notables like Brian “The Predator” Rogers, Dan “Dragon” Spohn, and more, the Intimidation name has become synonymous with the knockout in mixed martial arts. And recently, this streak has continued on a national stage and around the world. At Bellator 119, longtime Team Intimidation member Brian “The Predator” Rogers produced yet another highlight reel flying knee knockout, when he put Adrian Miles to sleep in the second round of their middleweight bout. Rogers has produced some of the best knockouts in Bellator and MMA history, including his immortal flying knee over Vitor Vianna at Bellator 61 that has been named as the best in Bellator history multiple times. Rogers, who has produced 9 knockouts in 11 career victories, continues to be a fan favorite inside the Bellator cage. Dan Spohn made headlines with his 10-second knockout over Tyler King to kick off the season on The Ultimate Fighter 19, immediately making him a household name and favorite to win the season. Spohn (pictured, left) is no one-trick pony, however, as he also posted the fastest knockout in Bellator MMA history with 9-second flying knee over Dane Bonnigson at Bellator 51, and a TKO over UFC veteran Josh Hendricks at NAAFS: Caged Fury 15 that was the result of nasty elbows off of his back. In conjunction with his recent meteoric rise to the top of the mixed martial arts world, Intimidation has recently announced plans to release a signature tee for Spohn. Jordan Parsons may be known as “Pretty Boy,” but the longtime member of Team Intimidation is also one of the best lightweight prospects in all of MMA. The Minnesota native recently made his Bellator MMA debut at Bellator 117, where he moved his record to 10-1 with a knockout just 4 seconds into the second round over Tim Bazer. He needed just two punches in the second frame, landing a perfectly time 1-2 combo to put Bazer out. Brazilian Luis “Sapo” Santos has produced 34 knockouts in 60 career victories, and he has recently been laying waste to some of the best international fighters on XFC’s international shows in his native Brazil. After producing four first-round knockouts under the XFC banner in the U.S. – including an incredible three via head kick – Santos put Alfredo Morales to sleep with a front kick at XFCi 3 in March. Bellator 51 was a banner night for Intimidation, as along with Spohn’s knockout, Intimidation also sponsored lightweight Joey Holt in his flying knee victory over Clint Musser, and Alexis Vila as he produced his “shot heard round the world” knockout over former Bellator champion Joe Warren. And with another notable, Nick Duell stopped Jason Buck with a highlight reel upkick at NAAFS: Caged Vengeance 12 in 2012. Duell (pictured, right) is also a knockout artist, with 7 knockout victories in 11 career victories. He also holds notable KO/TKO victories over “The Ultimate Fighter” veterans Julian Lane, Kevin Knabjian, and Daniel Head. Intimidation Clothing is a fast-growing brand of MMA style clothing & training gear with a growing national presence and over 50 authorized dealers across the USA. Known as the biggest supporter of local MMA, the Intimidation brand is also regularly featured on multiple sporting events on SpikeTV, AXS TV, SportsTime Ohio, MTV2, FUEL TV, The Comcast Network, Comcast SportsNet and EpixHD as well as MMA highlight shows on Spike TV, AXS TV and more. In addition to over 110 styles of high-quality, bold t-shirts and sweatshirts for men, women and children and is also known for their premium-quality EliteFighter MMA board shorts. Anyone interested in becoming a dealer can apply to sell the Intimidation brand as a dealer and they can be found for sale online at IntimidationClothing.com. Fans can also follow the marketing wing of the Intimidation brand, Intimidation Interactive Media, @IntimidationIM, like Intimidation Clothing on Facebook or follow @IntimidationMMA on Twitter. Intimidation Clothing had a “knockout” of a weekend, with Team Intimidation producing one of the more memorable weekends in recent memory. From highlight reel finishes on a national stage to successes sponsoring local and regional MMA events, Mother’s Day weekend was another shining achievement for Team Intimidation. Team Intimidation cornerstone fighter Brian “The Predator” Rogers produced yet another highlight reel knockout win, as he put Adrian Miles to sleep with a flying knee in the second round of their middleweight bout at Bellator 119. Rogers has now produced 9 knockouts in 11 career wins, and he produced the latest victory while walking out wearing his latest signature shirt, which features him landing one of his patented flying knees. The win was also the Attack Poker “Attack of the Night” on the Spike TV broadcast earning Rogers even more recognition with the fans of Bellator MMA who already know Brian from the flying knee KO of Vitor Vianna at Bellator 61. In other news, Team Intimidation fighter Rob “The Destroyer” Morrow (14-16) produced yet another win, as he earned a second round TKO victory over Rashad Brooks at Extreme Challenge 231 in Iowa after taking the fight on just two days’ notice. Morrow (pictured, lower right) has now produced 5 wins in his last 6 bouts, and is 7-3 in his last 10. He is also the Intimidation sponsored Colosseum Combat light heavyweight champion. Intimidation’s Kentucky/Indiana crew was on hand at the inaugural Indestructible Fight Club event in Owensboro, Kentucky, which was promoted by the same group that runs the Indiana Fighting Championship. The group had another banner night, selling Intimidation’s popular brand of t-shirts, hats, hoodies, and more and saw the selection of Intimidate Cancer tees as the popular style of the night. To cap off the weekend, UFC Fight Night 40 saw two Intimidation alums in action with Daron Cruickshank and Anthony Lapsley both in action. While Lapsley did not have the result he wanted, Cruichshank scored another highlight-reel KO of his own only to be overshadowed by Matt Brown’s performance in the night’s main event. Brown, who held a MMA seminar at GriffonRawl MMA Academy in August 2010 which was sponsored by Intimidation Clothing, scored a thrilling TKO win over Erick Silva in the 3rd round in Cincinnati. Looking ahead, Intimidation has yet another busy weekend set coming up, with four events sponsored in four different states. On top of that, all four events are in different aspects. Intimidation’s IN/KY crew will headline the weekend as they travel to Kokomo, Indiana for the long-time sponsored Colosseum Combat MMA promotion. In Ohio, an Intimidate Cancer event will take place as Intimidation will be on hand for the Hubbard Leukemia Society Fundraising Family Day in Hubbard, Ohio. Intimidation will also be on hand at the New York State Grappling Championships in Fredonia, New York, as well as Prison City Fight League’s “25 to Life” MMA event in Jackson, Michigan. Cinco de Mayo weekend kicked off a massively busy May for Team Intimidation, which is expected to lead to a successful summer and beyond. Intimidation sponsored a Brazilian Jiu-Jitsu world champion, a fighter in a kickboxing event, and a one of the longest running amateur MMA events in the state of Ohio. Fast-rising Brazilian Jiu-Jitsu world champion Marcelo Nunes (3-0) is making waves in the mixed martial arts middleweight division, and he is one of the newest members of Team Intimidation. The Minneapolis product defeated previously unbeaten John Soliz (2-1) via submission in the first round at Xplode Fight Series’ “Anger” in Davenport, Iowa, and later posed with UFC flyweight contender John Dodson for a picture (right). Brian Camozzi, the younger brother of UFC star Chris Camozzi, made his professional kickboxing debut at Glory 16 in his hometown of Denver, and he put on an impressive showing in losing a unanimous decision to veteran LT Nelson. The 22-year-old remains one of the best prospects on the hot regional MMA scene in the Denver area. The official Intimidation booth was also on hand at MMA Brawlroom’s latest event in Campbell, Ohio, as St. Lucy’s Fight Night 6 showcased some of the best young talent in Ohio, Pennsylvania, and New York. Fans flocked to the booth to check out Intimidation’s latest styles of t-shirts, hats, and hoodies. Finally, Team Intimidation’s own Brandon Hurst was busy walking the red carpet in Louisville at the 6th annual Silks of the Bluegrass event Saturday evening in support of Operation Open Arms. Looking ahead, Team Intimidation’s Brian “The Predator” Rogers will be back in action on May 9, as he faces Adrian Miles at Bellator 119 in Ontario, Canada. Intimidation’s Kentucky/Indiana crew will also be on hand for the first event, “Fight Night 1,” from the Indestructible Fight Club in Owensboro, Kentucky on May 10. The organization also runs events in Indiana as the Indiana Fighting Championship. This will kick off a busy month of May for Intimidation’s Kentucky/Indiana crew which is set to branch out into Tennessee’s Local MMA scene as well. After an unfortunate situation leading up to his last scheduled bout in March, Team Intimidation’s Brian “The Predator” Rogers already has his next date inside the Bellator MMA cage scheduled. Rogers (10-6, 3-4 Bellator) is set to return at Bellator 119, which takes place on May 9th at Casino Rama in Ontario, Canada. Rogers will face Johan Romming (9-4-1) at the event. Known for his devastating knockout power, Rogers has compiled a long list of highlight reel knockouts and is one of the most popular middleweights in Bellator. In his 10 pro wins, Rogers has won via 1st round stoppage nine times with 8 KO/TKOs. A native of Northeast Ohio, Rogers trained with the Strong Style Fight Team for years but has transitioned his fight camp to Colorado for this fight, where he is training at Factory X Muay Thai with the likes of UFC middleweight Chris Camozzi (pictured with Rogers, right), former Bellator world champion and current #1 contender Joe Warren, Team Intimidation’s Brian Camozzi, and more. A 2-time Bellator MMA Middleweight Tournament semifinalist, Rogers is no stranger to exciting finishes, including a flying knee over Vitor Vianna at Bellator 61 that has been named as the best knockout in organization history multiple times. Known for his devastating knockout power, Rogers has compiled a long list of highlight reel knockouts and is one of the most popular middleweights in Bellator. In his 10 pro wins, Rogers has won via 1st round stoppage nine times with 8 KO/TKOs. A longtime sponsored fighter, Rogers also has his own Intimidation Clothing signature t-shirt. The former special education teacher is now a full-time fighter, and he made headlines when he had a fundraising drive to raise money for his former school prior to a fight last year. He also continues to give back to the education community as a public speaker and more. Fans of Rogers can pick up the latest official Brian Rogers signature tee from Intimidation Clothing, which features him landing a flying knee. Intimidation Clothing is a fast-growing brand of MMA apparel & training gear with a growing national presence and over 50 authorized dealers across the USA. Known as the biggest supporter of local MMA, the Intimidation brand is also regularly featured on multiple sporting events on SpikeTV, AXS TV, SportsTime Ohio, MTV2, FUEL TV, The Comcast Network, Comcast SportsNet and EpixHD as well as MMA highlight shows on Spike TV, AXS TV and more. In addition to over 110 styles of high-quality, bold t-shirts and sweatshirts for men, women and children and is also known for their premium-quality EliteFighter MMA board shorts. Anyone interested in becoming a dealer can apply to sell the Intimidation brand as a dealer and they can be found for sale online at IntimidationClothing.com. Fans can also follow the marketing wing of the Intimidation brand, Intimidation Interactive Media, @IntimidationIM, like Intimidation Clothing on Facebook or follow @IntimidationMMA on Twitter.